Bengali wedding is an extravagant event. Traditionally the festivities lasted for two days but now the rituals are cut short. Like all Indian weddings it’s not just the union of two people, it’s the union of two families. Indian wedding traditions are very different when seen according to communities. The traditions followed by south Indians are totally different to that followed by north Indians. But they are similar in one term and that is the union. Everyone believes in the fact that it’s not just the bride and the groom who becomes one. It’s the bond of the entire family. Adan Pradan – It’s the first ritual that involves in a Bengali wedding is checking the gotra, which means ancestral lineage of the bride and the groom. It’s done by the priest in presence of both the families. Engagement or Ashirbaad – It’s the beginning of any wedding. It’s like a promise given by both, the bride and the groom that they will be together for the rest of their lives. The time period between the engagement and the marriage can be a month or a year. It depends upon the date fixed. Prayers and Dodhi Mangal – When it comes to Bengali wedding rituals it starts a day before the actual wedding, with prayers offered in temples. On the day of the marriage early in the morning prayers are offered at both the houses of the bride and the groom. There is a ritual called dodhi mangal where the relatives of both bride and the groom invite Goddess Ganga for the wedding. Actually, they fetch the holy water and bring it back home, to bathe the bride and groom. Not everyone can get the holy water, so it’s a ritual that can be performed by taking water of any good river. Gae Halud – This ritual takes place after dodhi mangal. 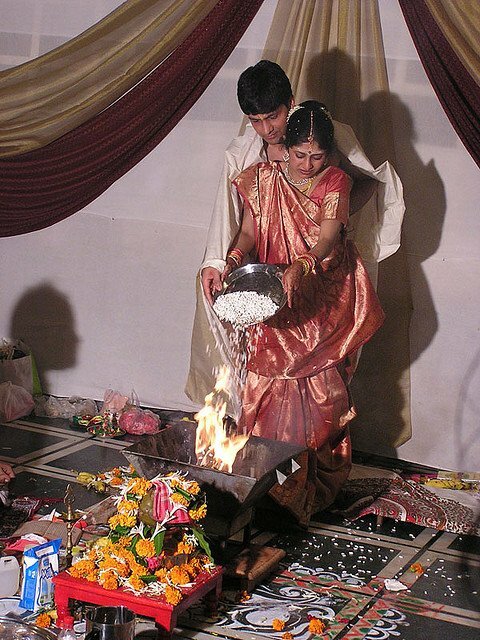 This rituals is practiced i most of the Indian wedding styes, not just Bengali wedding. Traditionally the halud or turmeric had to come from the groom’s place. Along with a fish, yogurt, sweets and gifts, these gifts are known as tattva. Similarly gifts are sent to the groom’s place too. Sankha Porana – Conch shell bangles are known as sankha. It’s a mark of a married woman, when it is worn the priest chants sacred verses for a long lasting relationship. Borjatri – Later according to the time given by the priest, the groom and his family has to come to the girls place to get married. Nowadays both the parties come to the venue. Sindur Daan to Bou Boron – Then the priest chants mantras from the holey text and it’s followed by hawan, puja, phera and finally sindur daan. It’s there in every Hindu wedding; the sindur is the mark of a married woman. After all this is done the dinner is served. Then comes bidaai when the bride goes to the grooms place, but the festivities doesn’t end there. There is bou boron which is the welcoming ceremony of the bride at her new home. There are some rituals done in a Bengali wedding at the grooms place as a welcome gesture to the new bride. Kaal Ratri – On the first night of their wedding the newlyweds are not allowed to be together. Usually both are accompanied by their friends or family member and engaged in fulfilled activities. Bou Bhaat & Phool Sojja– It takes place on the next day, during this ceremony the bride will serve food for the first time to her in-laws and their close friends. Now it has become like a reception where the bride’s family and friends also join for the feast. Phool Sojja is the evening reception and the first night that couple is officially allowed to sleep in the bed room with beautifully decorated bed with flowers (phool). One thing that is very important is the muhurat or the time. In which every ritual has to take place. It’s believed that the planetary moves affect the newlyweds, thus it’s considered as an important thing during every big occasion. Bengali wedding involves a lot of work a whole lot of sleepless nights on planning. Which is very essential, a well planned event is always the one that outshines. As far as planning is concerned the bride starts planning much ahead before everyone else because her dresses are very important. In a typical Bengali wedding the bride requires to wear a sari but that’s up to the bride if she wants to wear a lehenga she can wear that too. The traditional Indian wedding dress is sari but the style of wearing depends upon what the bride wants. So, when it comes to sari you need not fly to India to buy one. There are many designers and stores in almost every part of the world that sells the traditional wear. So, you can buy one from anywhere you want. As per the color of the bridal outfit, traditionally it was a red. One with lots of embroidery and work on it, but now the trend is slowly changing. The popular colors chosen by the brides are pink, purple, green and blue. In case of designer ones you can give your ideas and the designer will create it for you. As per the material usually its banarasi silk but you can buy one in silk, georgette etc. As for the outfit of the groom in a traditional Bengali wedding is basically dhoti and panjabi (aka kurta) but now that is changing too most grooms prefer sherwani. As long as the bride and the groom are comfortable in their attire and they look good together nothing else matters. When it comes to getting the Bengali bride ready, you can hire a makeup artist and hair stylist who will do the hair and makeup. As for draping the sari in a traditional Bengali way, it’s best to leave that to the older female relatives because they will know it the best. There are beauticians who can do it too. Bengali wedding is not just about the rituals and dresses. It’s about having a great time together and having great food too. As per the food if you want you can have all authentic Bengali food or you can include dishes from other countries too. The caterer has to be arranged well in advance. So has to be the venue because memories are going to be connected to the place so you should get what you have always wanted for your dream Bengali wedding.